Being a succubus of US Taxpayer money since at least Feb 15, 1976. "One thing had changed before the March vote: in late January, investors with ties to Macau junket promoter Hengsheng Group had hosted four key CNMI senators on a visit to Hong Kong and Macau, one of a series of so-called “fact-finding” trips from late last year by CNMI elected officials, including Governor Eloy Inos. Best Sunshine’s parent company, then called First Natural Foods, announced its investment in Hengsheng last November, paying 400 million Hong Kong dollars ($51 million) to the younger sister of First Natural’s 34 year old controlling shareholder for an estimated 5% share of the junket promoter’s profit stream." "A $600,000 grant will fund a successful applicant’s participation in the National Forum for State and Territorial Chief Executives, the CNMI Office of Grant Management announced last week. The national forum assists governors and key policy staff to develop and implement innovative solutions to governance and policy development in their jurisdictions... The grant is made available through the U.S. Department of Health and Human Services." Where shall we fly off to next? SAIPAN, CNMI (Marianas Variety, July 8, 2014) – A $4 million grant for young adults who want to pursue natural resource conservation careers is now available, the CNMI Office of Grant Management announced yesterday..."
"UP to $700,000 in grant funding is now available for non-profit organizations within the U.S. territories that want to implements projects and programs for coral reef management, the CNMI Office of Grant Management announced yesterday." "For years, Democrats, led by Congressman George Miller and President Bill Clinton fought to end the abuse. The fought to extend US labor, immigration and customs laws to the runaway Territory. They also fought to grant long-time guest workers rights and a clear pathway to US Citizenship. In the 1990s some of these workers had already been on the CNMI for 15 years. Tonight they have been there for 25 years—and they are still without rights." 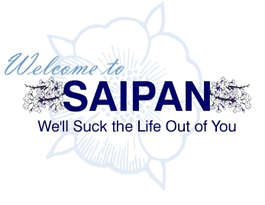 Contribute on government waste, corruption, travel junkets or outrageous CNMI experiences below. Personal experiences are always welcome!